1Okung D. Ntofon (e-mail: okung.ntofon@bristol.ac.uk) and Dimitra Simeonidou are with the Department of Electrical and Electronic Engineering, University of Bristol, Bristol BS8 1UB, UK. 2Martin J. Reed is with the School of Computer Science and Electronic Engineering, University of Essex, Colchester CO4 3SQ, UK. 3Szymon Malewski and Maciej Glowiak are with the Poznańskie Centrum Superkomputerowo-Sieciowe, Poznań, Poland. The emergence of beyond high definition digital media formats is a key driver for future networked media applications and services. The data transport and computational requirements of these emerging digital media formats are significantly greater than those of pre-existing media formats. Therefore, there is the need to deploy high-end media processing and storage resources interconnected by high-performance optical networks. To this end, a service-oriented control framework is proposed to facilitate user context-, media-, and network-aware service provisioning. 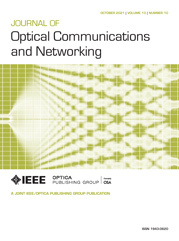 We investigate one of the principal functionalities of this framework: Joint scheduling of media and optical network resources. The immediate and advance user request models are presented. These models are applied to several proposed heuristic algorithms and mathematical formulations based on integer linear programming (ILP). These algorithms and ILPs are comparatively investigated by simulations. The results show that our algorithms and ILPs are able to facilitate high acceptance of user requests as well as effective and efficient use of available media and optical network resources. availSites Available service sites: The set of service sites with available media processing and storage resources that have the content requested by the user and the computing capacity to deliver this content with the explicitly specified format. CCA ( s , t ) Compute capacity available: The amount of computing capacity available at a service site s i at time t when a user submits its request. H s i , u min Shortest number of hops: The shortest path between a service site, s i , and a user, u , with sufficient bandwidth on all links to deliver a specified digital media format. RCC ( u r ) Required compute capacity: The amount of computing capacity required to deliver the user request u r with the explicitly specified format. DUR ( u r ) Request duration: The duration of the user request u r computed by ( t r stp − t r str ) . CCA ( s , τ ) Compute capacity available: The amount of computing capacity available at a service site s i for the duration of a user request, τ = ( t r stp − t r str ) . 5: R ← max RCC ( u r ) ; ∀ u i ∈ U ; get requests requiring the most RCC ( u r ) . 7: R ← min RCC ( u r ) ; ∀ u i ∈ U ; get requests requiring the least RCC ( u r ) . 10: u r ← min DUR ( u , r ) ; ∀ r i ∈ R ; if multiple requests exist with the same RCC, choose u r with: Shortest DUR ( u r ) . 11: //If multiple requests exist with shortest DUR ( u r ) , randomly choose u r .